Molecular genetics focuses on studying topics in modern biology concerning how genes control cellular functions, development and disease. A degree in molecular genetics is an excellent preparation for many careers in the life sciences and beyond. Our courses and research opportunities cover a broad range of topics from molecules to populations. The common focus is on the role of genes and the use of molecular and genetic techniques in each of these areas. Molecular genetics graduates typically pursue advanced degrees leading to academic and professional careers in the life sciences. Molecular geneticists with a PhD degree enter academic or industrial careers, with leadership roles in research and education. Some Molecular genetics BS graduates pursue more specialized master’s degrees, such as Genetic Counseling, Forensic Sciences or Biotechnology. Many molecular genetics BS graduates go to medical school and other professional schools. For more information visit the Department of Molecular Genetics website or view the university's major curriculum sheet. Have a question about Molecular Genetics or want more information? Let us know. A BS in Molecular Genetics is the entry point into a number of rewarding careers. Most of the graduates enter careers in life sciences, but there are many other opportunities, such as law, business and government. With a BS in Molecular Genetics, there are many opportunities to work in laboratories within universities, agricultural and medical biotechnology industries, or federal and state government agencies. The molecular genetics major is concerned with current knowledge of the molecular nature of genes, their roles in controlling the function and development of organisms, their inheritance and their evolution. The research and teaching interests of the faculty range over all areas of modern genetics as well as molecular, cellular and developmental biology. Molecular geneticists with a BS degree often work as laboratory technicians. They are in demand to work on research projects in universities. Federal and state government agencies, such as the National Institutes of Health, the Department of Energy, the Department of Agriculture and the Environmental Protection Agency hire molecular geneticists to work on a variety of applied research problems. The new and growing biotechnology industry is largely based on the expertise of molecular geneticists. Plant structure and function; growth and development; diversity, reproduction, and evolution of lower and flowering plants; people, the biosphere, and plant diversity. The principles of genetics, including molecular genetics, transmission genetics of prokaryotes and eukaryotes, developmental and non-chromosomal genetics, recombinant DNA and genomics, and the genetics and evolution of populations. Analysis of the structure and function of animal and plant cells and their components, stressing molecular genetic and biochemical approaches. Analysis of animal and plant development using modern genetic approaches. The Ohio State University Molecular Genetics Club provides undergraduate students majoring in the biological sciences or students with an interest in genetics with an opportunity to meet, discuss and learn from experienced researchers, Ohio State faculty, and professionals working in the field. Undergraduate students in molecular genetics have many exciting career opportunities and doing research is excellent preparation for them. 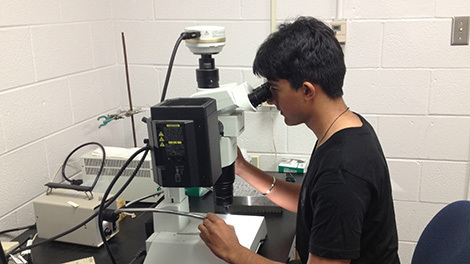 Obtaining research experience in a faculty member’s laboratory not only gives a student exposure to cutting edge research techniques, but additionally can help a student determine which career option is right for them. This library’s resources cover a wide range of subject areas; including biochemistry, biology, biotechnology, ecology, entomology, evolution, medicinal chemistry, microbiology, molecular genetics, pharmacy, pharmaceutics, pharmacology, pharmacognosy, pharmacy administration, organismal biology, plant biology and zoology.